Mainland Chinese actor Andy Zhang’s (張丹峰) recent affair with his manager, Bi Ying (畢瀅), has taken the media by storm this past week. This is not the first time rumors have run rampant about Andy’s alleged affair with Bi Ying. 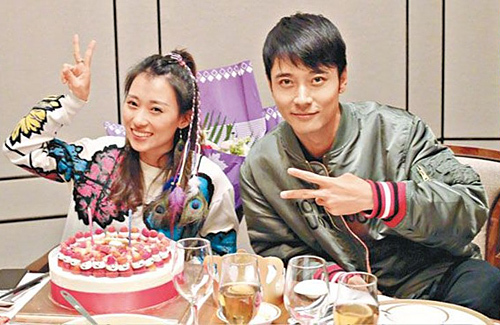 In July 2018, allegations of Andy’s infidelity and his questionable relationship with Bi Ying surfaced. At the time, his wife of nine years, Hong Kong actress Catherine Hung (洪欣), defended her husband and refuted the accusations. This time, however, the evidence may not be that easy to ignore. The Chinese media released photos and videos, which shows Bi Ying visiting Andy’s hotel room in the middle of the night and spending more than three hours in there. Rather than stepping up to support her husband this time, Catherine instead has kept her silence regarding the matter. Recently, tabloids have dropped an even bigger bomb, claiming that Bi Ying is pregnant with Andy’s baby. In one of the photos alluding to their affair, reporters noted that Bi Ying seemed to be holding on to a suspicious small, white stick. Upon further observation, the small, white stick appears to be a pregnancy test wand. Netizens, however, were skeptical about this far-fetched claim and argued that Andy may have been feeling unwell. The object she was holding was also speculated to be a thermometer probe. An insider further revealed that during the Chinese New Year holiday this year, Catherine surprised Andy with a surprise visit to Chongqing, where he was filming a new drama. When she arrived, she was shocked to see that Bi Ying was also there. Allegedly, Andy begged for Catherine’s forgiveness when the affair first came to light in July 2018, where he swore to never work with Bi Ying again. Seeing Bi Ying on the film set and realizing that Andy had broken his promise, Catherine left in anger. 22 comments to Andy Zhang’s Mistress, Bi Ying, is Pregnant? Wow! If this mistress/home wrecker is really pregnant – who needs screen writers. They can use their own real life story for a drama. It’s even more intense than a make up story one. The wife needs to be smart & hope that she can win this battle. I want to see karma to the cheater & the home wrecker. This woman seems to be a very cunning and calculating one, so most likely the supposedly scenario of caught red handed in the hotel recently was her plan…. She planned to get caught deliberately. Whatever the situation is Zhang’s career won’t be the same…. @niangniang I hope the Chinese viewers are less forgiving towards trash, just like us. Zhang doesn’t have a big fans base to begin with…He is not DengChao or HuangXuan. So with added scandal like this for sure he have to kisses his career goodbye…. I feel for Catherine, I don’t feel sorry for her in particular but the children. I think I mentioned before about why his manager is always somehow around looking at their vacation pictures just reading the body language. I can see the manager really smiling up holding one of the kids hands, then Andy next to them smiling too and then you see Catherine meekly standing on the other side not so smiling. So much is said in that picture if you really look at it, she really looks sad, and worse doesn’t appear to be looking like the wife like how the manager is looking. I’ll say that this manager has already crossed the line of being a manger but more like “lady in waiting-to-be-the-next-wife” position. She’s crossed that manager line so many times, & Andy knows it and worse, he is allowing it to happen instead of reminding the manager that business is business but now this is looking like “monkey business”, & she needs to stop. Maybe Andy doesn’t feel like he & wife aren’t in a marriage, I say yes, because right there it reminds me of of what Princess Di with through with Prince Charles having Camila on the side lines for a long time. She did admit that you can’t have 3 people in a marriage; & this looks like what this is. Either Andy has to take a firm stance with his manager that she needs to allow him not only as his manager but allow him to be a husband/father to his wife & kids. Just keep their relationship a business one only. I think he dropped that barrier, that line in their relationship too as agent/actor. Think this manager wants more. Now if there is positive evidence that she is pregnant then Andy has a lot to resolve on his plate, needs to think about that & more so about his future. Which is it? His wife or the manager? and the kids. Does he want to let his family go or opt for manager. He better think long and hard, but he needs to get away from that predatory manager whose honing in on him and his family, she sounds desperate, she needs a life.She needs to stay away from him and his family, that’s a given, she should’ve drew that line between them ages ago because she is not being a manager sounds like, she wants to be his next wife. She sounds like she’s seriously focusing on becoming his wife. If there’s a divorce, he has to pay child support, maybe alimony, etc. Is he willing to let his family go? What kind of future will he have then, what kind of future will his wife and kids have? Was it really worth it? Once you have a young, desperate single female as your manager, problems will start. Situation gets serious. Next time get a male manager, shouldn’t be a complicated business relationship. It is a sad, sad situation that needs immediate attention, could be a messy one. Wife needs to take her position as a wife, weed out that mistress/manager once and for all, otherwise??????? Think the manager got more than her 10%, you think? Wife is entitled to do what a wife has to do, it’s her and her husband’s decision, not manager to discuss their future, their marriage, their family. Mistress/manager needs to keep her nose out of it. I never liked homewreckers, and sounds like she’s becoming one. Good Luck, hoping for the best. The home wrecker is terrible & the husband is trash also. It takes two to tangle like they always say. This one qualifies as one of the dirtiest. In some pictures i think he looks older than his wife. Is he the dirtiest cheat since Shirley Yeung??? Just by this mando girls idiotic pose, she look like he needs a punch in the face…. They deserve each other – same type. He is complete trash now. I hope the wife gets all her money back!!! I did have a feeling this little brat could be pregnant like I said you never know what’s next. Catherine needs to be strong for her 2 kids hopefully she doesn’t do anything stupid because of the cheater husband. I am wonder too is he going for a younger one just because his wife is 10 years older than him? If that’s the case then he shouldn’t married her the first place. Anyone know the age of this cheating brat? The cheater is 38 years old. Oh! I don’t know her age. I just know she is a home wrecker. Being someone who liked watching Andy in the past, I am severely disappointed in him. I gave him the benefit of the doubt when this was reported last year but now I am indifferent towards him. Regardless of what level he is now with his manager, he needs to leave Catherine’s life. The kids need a better father than him. Better no father than a lousy one. Ashley has been accepted into acting school and Catherine still has some income from ads. And for someone who does only one or two series per year and mainly relies on main income comes from endorsements of family products, he can say goodbye to his career because producers, sponsors and audience will now boycott him and his existing contracts may even get him to pay compensation for loss of image. And they can’t chase Catherine for the money since her name has been taken off the company. As for the manager, she can say goodbye to her career as well because no artist of the sane mind would want to employ her. Good luck to both of them as they are a match made in heaven. This is sad! Hope his career will go down hill and he can rot in hell. I hope Catherine get her money back and leave Andy Zhang penniless. Would like to see if this home wrecker will still want to be with Andy Zhang when he is penniless. omg, this man and woman is so distinguishing. having done such a terrible thing to a woman that the man once loved so dearly before and no shame in doing her wrong…. this scumbag and homewrecker are made for each other. having been on this planet for a while, there’s not such a thing as karma but i wish it exists.